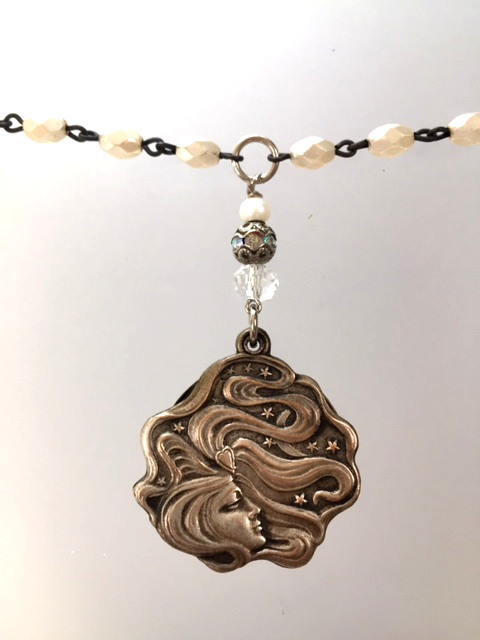 A unique combination of an antique C1890 French Photo Locket embellished with a Gypsy, with flowing Locks and Stars. There is an Angel photo in the locket, but it could easily be replaced with your Loved ones photo. It is suspended on facted Ivory beads completed with silver Crystals Shaped Opal Beads. The locket slides open and functions well. Necklace is 18" long, locket is 1" round. If you have a love French Gypsy's, here is a piece you can with with pleasure and pride!